Resident Evil 4 On PlayStation 4 That Is! 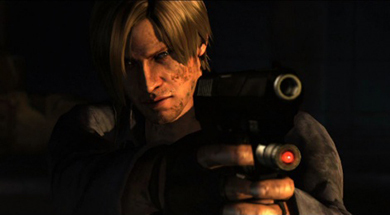 » Resident Evil 4 On PlayStation 4 That Is! Ah Resident Evil 6 has literally just dropped as I write this. And I mean literally, I just got a text of a good friend of mine showing me his copy he bought from the store. I just wanted to chime in with my memories of the Resident Evil series and not just that, but my thoughts on where I would like the series to go when we head into the next generation with the PlayStation 4. The first I ever heard of Resident Evil was from a buddy of mine in my third year of high school (showing my age here) anyway he had a magazine and he kept going on and on about Resident Evil to the point I was like “what the hell is Resident Evil” He showed me the pictures, but it just did nothing for me. It was not until I saw the game in motion that I was just in complete awe. It was like a horror movie and I must admit while its fun to go back and make fun of the voice acting. And yes it is bad. At the time however it was very weird voice acting, but we kind of never had an issue with it. I got really caught up in the hype for Resident Evil 2 it was by far my most anticipated game in this series. And when I picked it up that cold winter morning complete with my limited edition Resident Evil 2 memory card. I was hooked. I mean seriously I was addicted to this game I pulled an all-nighter and beat the Leon game mode that first day I had the game. Resident Evil 2 was such a great sequel it was bigger and better in every way imaginable. For what ever reason Resident Evil 3 just never grabbed me like the 2nd one did. I am not saying it was bad or anything like that. I actually know some people who like that best out of the original games, but it just didn’t click for me. What did click for me was the preview video I saw for Resident Evil: Code Veronica on the Sega Dreamcast. I could not believe how amazing this game looked. Code Veronica for me is the best out of the old style Resident Evil games. I was one of the people who saved there game on the plane right before the Tyrant battle with no health items and pretty much zero ammo. Of course there was the GameCube remake and the Resident Evil Zero. But the next big thing for me in Resident Evil was Resident Evil 4. This may not be a popular opinion, but Resident Evil 4 is the best Resident Evil game. Resident Evil 4 is one of the best action games I have ever played. Heck I will go as far to say that it is one of the best video games I have ever played. I know that some people are not fans of the direction the series took here, but from a game play point of view the game in my eyes is perfect. Counting the GameCube, Playstation 2, Wii and Xbox 360 I have easily beaten this game 20+ times. Resident Evil 5 for me was a huge disappointment. The thing that killed the game for me was the forced co-op I never got to experience Resident Evil 5 with another person so I had to rely on the AI to control Sheva. I swear that within my first hour I knew that the AI was going to be a huge problem and I was right it really ruined what would have been a game I would have actually enjoyed otherwise. Resident Evil 5 did give us the amazing lost in nightmares DLC which was really cool it kind of mixed the old Resident Evil with the new one. Of course I have yet to spend some serious time with Resident Evil 6 so I can’t comment on that as of writing, but lets talk about Resident Evil on the Playstation 4. What I personally want to see from a next generation Resident Evil is more of the same. I know this is not a popular opinion, but I cannot go back to the old way of playing Resident Evil. At the time I loved those old Resident Evil, but from a game play point of view they have aged terribly. Whether people like it or not Resident Evil is no longer a survival horror game. No mater what we say it is not going to go back to that. I think though that the Resident Evil 5 lost in nightmares DLC and the Resident Evil Revelations on the Nintendo 3DS have shown that Capcom are capable of blending the action orientated game play with the I guess you could say feel of the older games. Resident Evil 4 on the Playstation 4 I am sure will be a graphical tour de force. Capcom make great looking games especially the Resident Evil ones so there is no need to worry about the looks in my opinion. What I do want though is more control. I have said that I have not played Resident Evil 6 yet, but the early reviews have criticized the amount of quick time events and the amount of cut scenes. That for me above all else is what I want from the next gen Resident Evil 4 a way to let me the player control what is happening in some of these cut scenes. I know that may sound a little ambitious, but I certainly think it would help bring a little of the horror back to the games if during a cut scene you never knew if you were going to need to take control. So what about you guys? What are your hopes for when Resident Evil hits the PlayStation 4? And what are some of your memories of the series so far? The Resident Evil that we have today is a far cry from what the series was originally, when it was released on the PlayStation back in 1996. While many gamers have come to embrace the change. The series has become far more about action, than survival horror. A recent interview with Masachika Kawata may give those wanting the series to return to its survival horror roots some hope. While he said that survival horror was not as profitable as action games. He did say that Capcom “are always taking into account user feedback”. What is so great about this, is the game Resident Evil Revelations which was released on the Nintendo 3DS. This game was very well received, and it did a great job of taking the series back to its survival horror roots. But, also keeping in a great deal of action. Well the game is due to be re-released on the Playstation 3 and Xbox 360. So if the game is a huge hit, maybe this is the “feedback” Capcom needed to see, that there is still a market for a more survival horror driven Resident Evil. Talk about the future of PlayStation 4 games on our PS4 forums! Could Dishonored 2 on the PlayStation 4 be twice the game Dishonored was? Call of Duty Black Ops – What does it mean for the PS4? Cool post Jason, yep this game brings back memories too. Resident Evil rocks. Didn't they say that 6 was supposed to be more Survival horror? Instead the only horror I recieved was how my thumb bled from pressing too many quick time buttons and running from 99% of the enemies (since usually you just had to access the next area in order to proceed, not actually fight). I'll believe it when I see it (although there is hope in me). As for 4. It kinda hurts that I feel like they're milking the game way too much. I enjoyed it, but I don't feel like it nededs to be put on ANOTHER console. It's good how it is, just let it rest for a while. Atleast to me. Once they lost their way they lost me. After code veronica RE took a nose dive an never recovered though I do have every RE after the last one I got that is broke down into chapters an Re 6 I'll never buy another 1 unless they go back to their roots RE1, RE2, Code Veronica if it aint like them 3 count me out capcom ruined what could have been a great series for years to come.